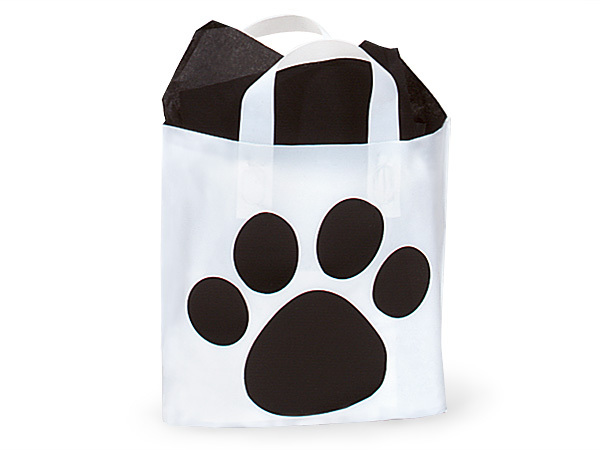 Piccolo Paw Print Studio Bags Frosted Plastic Bags 12x10x4"
Our Paw Print Frosted Studio Bags are a plastic version of the popular Pooch’s Paws. Large black paws are printed on matte white film. This design is easily imprinted for a custom look. Studio Plastic Bags have wide bottom gussets which allow the bags to stand up on their own without cardboard inserts. Bags are made from 2.25 mil film with thick 6.5 mil soft loop handles. Made in the USA. · 100% recyclable. Collections at most major groceries and chain stores.